This morning, I was thinking about Pencils of Promise, a wonderful organization started by a young man named Adam Braun. He was inspired to start PoP after a simple, yet life-changing encounter with a young boy he met on the road while traveling through India. Adam asked the young boy what possession he would want most in this whole world. I still get chills typing that, and I’ve heard this story time and time again. It never ceases to stop my breath for a moment as I consider that little boy’s circumstances and also his wisdom. Can you imagine? I mean, really? I try, I really do. But I just can’t fathom that. A pencil! This morning as I was sifting through the dreaded writing utensils pile, chock-full of busted up party favor Teenage Mutant Ninja Turtle and Frozen pencils, eraser-missing Ticonderoga pencils, lead-less sparkly mechanical pencils, and a barrage of free pens, muttering under my breath about how “I’m not going to Target again for pencils, you need to take better care of your things” like a million other mamas across these United States, that little guy jumped to the front of my brain. Look at that mess. Aren’t we so lucky? To my credit, I resisted the urge to turn it into one of those “starving children in Africa” lectures that we all endured as children. Narrowly. It was on the tip of my tongue. But I knew that, like my younger self with the food issue, my lovely babies wouldn’t be able to empathize with that sweet boy. That’s not their fault, really, they couldn’t possibly comprehend what being so impoverished that you don’t afford a pencil is like. I both thank God for this every day as well as pray for the ability to raise them in a way that might help them understand. And to do something about it. So imagine my surprise when I logged on to Facebook after the privileged urchins walked to school and discovered that today is International Literacy Day. And that 250 million children cannot read. There is simply no way of wrapping one’s brain around that number. According to PoP’s website, that is 75% of the people who live in the United States. So. Many. Children. So what can we do? I mean, 250 million, we can’t possibly fix that in a day, right? Of course not. But that does not mean that we simply toss our hands in the air and say, “oh well, that’s more than I can handle” as we just get back to sifting through the 30 or so writing utensils we all have in “that drawer,” not even taking a moment to be grateful for that. 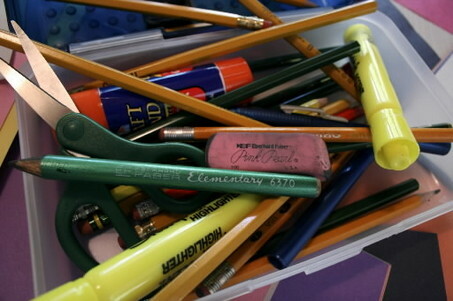 Maybe you have the means to donate to Pencils of Promise. Following what the call the “100% model,” 100% of every dollar donated online goes to their educational programs. Or perhaps you could take a moment to click on one of the many available links on this page to share their message on social media. It’s free, and it takes approximately 5 seconds. But if nothing else, let’s start by being grateful for that blasted drawer. The one full of broken pencils to our mind, the one full of promise to all those little guys and girls out there who want one more than any other possession in the world.